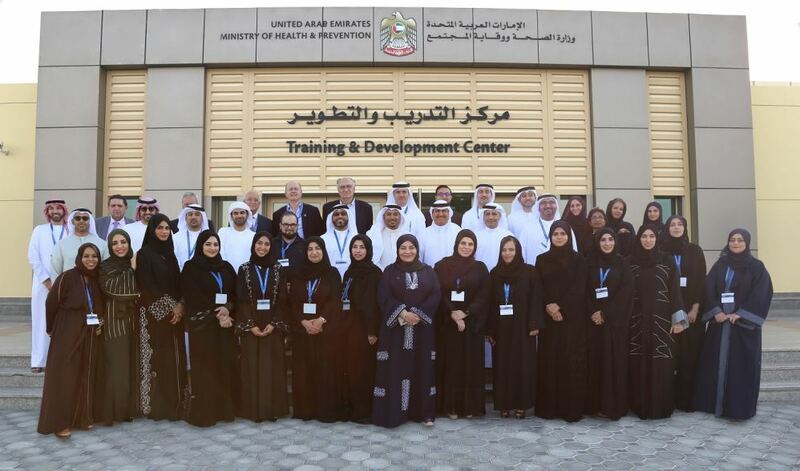 DUBAI, UAE - Nov. 15, 2017 - PRLog -- UAE, November 15, 2017 - The Ministry of Health and Prevention (MOHAP), represented by the Training and Development Center, organized the 'Leadership and Innovation in Health' training program in partnership with the University of Monash of Australia and the Harvard Macy Institute of USA, with the aim of training and developing the abilities of health sector leaders in accordance with international best practices. The program addresses several aspects of healthcare system design, health workforce planning, challenges to current health care delivery at the national and global levels, innovation in health care systems, and leadership of change through transformation. The program enlisted 50 delegates from national and GCC organizations. Senior Healthcare professionals joined from the Department of Health - Abu Dhabi, Dubai Health Authority, Mohammed Bin Rashid University for Medicine and Health Sciences, Al Jalila Children's Specialty Hospital in Dubai, Emirates Medical Association, Abu Dhabi Health Services Company, King Saud University, King Abdulaziz University and the GCC Health Council. In this context, H.E. Awadh Seghayer Al Ketbi, MOHAP's Assistant Undersecretary for Support Services, said that the region's health sector is undergoing a huge transformation. To keep abreast of this change, the Ministry of Health & Prevention, through the Training and Development Center, is constantly seeking to attract internationally recognized training programs. Such programs help raise the efficiency and quality of performance of leaders and medical and nursing staff to benefit from modern infrastructure, training and operating techniques, which will in turn help achieve patient satisfaction by enhancing the quality of health services. This is in line with the Ministry's strategy to ensure the provision of all administrative services in accordance with the highest standards of quality, efficiency and transparency; complete institutional capacity to activate a health training center adhering to international standards; encourage research and health studies to contribute to the planning process; and achieve sustainable development. Saqr Ghanim AlHemeiri, the Director of MOHAP's Training and Development Center, said that this program is aimed at developing leadership skills and innovation in the health sector. The program is the first of its kind in the Arabian Gulf region, with participants representing a select group of health professionals from within the UAE as well as other parts of the GCC. He pointed out that the training programs are in accordance with an annual plan based on the learning and development needs study of all levels of healthcare professionals. The e-library also provides digital scientific resources to train MOHAP employees as well as improve and enhance their capabilities with required professional skill sets and achieve the highest levels of quality in the delivery of health services, thereby achieving the Ministry's goal to establish a healthcare system of international standards, and achieve the center vision of "A Leading Training Center for a World-class Healthcare System"